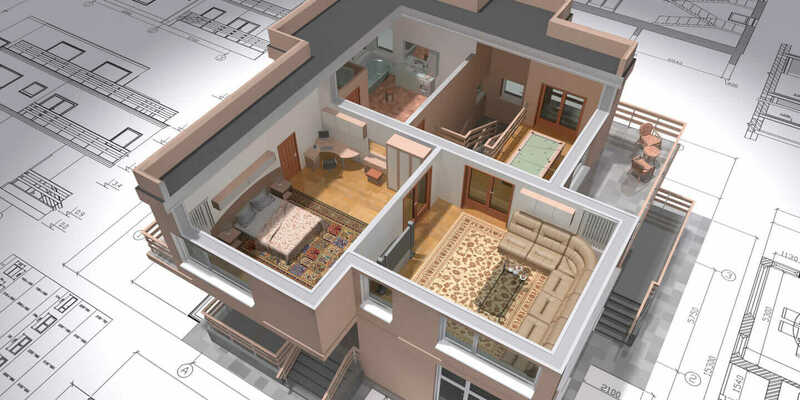 In AutoCAD (or even in hand drafting), dimensions merely reflect existing information. But in Revit, dimension objects can also drive geometry, providing you with even more control over your documentation process. When placing or selecting objects in Revit, you’ll often see temporary dimensions, light blue in color, appear next to your objects. They’re called “listening” dimensions, and they’re great for placing items with precision. When a listening dimension appears, you can use its displayed value to place your object, or type in a new distance. If you use the displayed value, rest assured that it is the actual value. Revit uses a dynamic snap system, so you won’t get stray 1/128th-inch measurements (unless, of course, you type them in yourself). Notice the images above. The listening dimension isn’t really in the most helpful location—I’d rather it went to the column line instead. To fix it, I can just click-and-drag using the blue dot on the extension line until it snaps to the line I want to use. Now that it’s in the right location, I can actually use the listening dimension to set my geometry. I don’t need to use the Move command. I can simply edit the value of the listening dimension, and the beam will adjust accordingly. I might also want to make it a permanent dimension, so that it will always be visible and show up when I plot the drawing. In that case, I can click on the small dimension symbol below the value to change the type. Now I want to add more dimensions, not all of which come from listening dimensions. For that, I’ll turn to the Annotate tab, and the Dimension panel. For now, I’ll focus on Aligned dimensions, but as you can see there are many other types for all your dimensioning needs. Aligned dimensions display the distance between two parallel lines, or between a line and a point. In the example below, there is a dimension between parallel grid lines and one between a grid line and the intersection of two others. Next, I’d like to dimension my beams. I already have one dimension, beginning at column line 1. Instead of creating more dimensions to measure the rest, I can simply select the original dimension and choose Edit Witness Lines. Then I can select the other beams, and click in the empty space when I’m finished. Often, for a string like this, we wouldn’t show all the numbers—especially when they’re the same. Clicking on the EQ symbol at the top of the dimension replaces individual numbers with “equality text” and moves the objects so they are evenly spaced. There’s another, somewhat hidden option for displaying equal spacing in a dimension string. Let’s say that for this bay, the original spacing was correct, but I want to point out that the end two spaces should always be equal. I’ll select the dimension, right-click, and choose EQ Display. Check out Part 2 of this Revit-dimensions series, when I’ll cover more options for equality text, along with other text-editing commands such as adding prefixes and suffixes. I might even (shhh!) show you how to overwrite your dimension text—but only if you promise not to abuse the power!